A settling foundation is very common in Georgia homes. Your foundation repair issues are most of the time due to bad drainage, ground movement, subsidence and poor construction, which will cause your foundation to shift and settle. you may start to take notice by doors or windows that will no longer open or close, and you’ll notice drywall cracks. Failure to properly waterproof around and under your basement walls and floors may be significant reason of your sinking foundation problem. Count on the pros at Atlas Piers for solutions to your settling foundation in Atlanta problems. The soils around your home, typically 6 to 8 feet below ground level, go through wet and dry cycles due to the seasonal moisture and temperature changes. When you have a drastic change like a heavy rainfall right after a drought, water moves through the soil at a greater rate than normal. The water always looks for the path of least resistance, if this path is leading the water through or under your foundation, settlement and cracks will start to appear. If you have soils with heavy concentrations of water, that can double in weight causing hydrostatic pressure to push against your foundation, or consolidate soils. This consolidation can cause your home’s foundation to sink because of the lack of support. 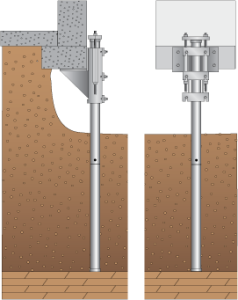 Helical piers and steel push piers are two common forms of underpinning that may be used in the case of a settling foundation. There are many advantages to underpinning. Underpinning provides a durable repair that will keep the home stable for years. Helical and push piers can be installed in any weather conditions. The installation of these piers leaves little mess. Underpinning may prevent water damage from cracked walls. Underpinning repairs many problems such as cracked, bowing, and leaning walls, sticking doors and windows, and a cracked slab. Underpinning is a useful tool that is utilized in most settling foundation cases in Atlanta. 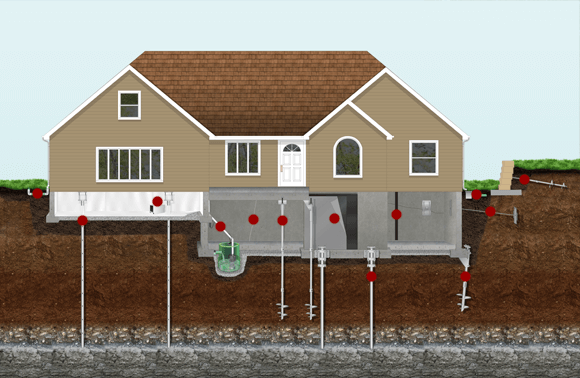 Underpinning prevents your home from sinking further into the ground, keeping your home safe and stable. For these settling foundation Atlanta needs and more, you can count on the professionals at Atlas Piers. If you are wondering about the cost of foundation repair, let us give you an estimate so you will know what the cost will be before the repair is done. If you are in need of professionals to take care of your settling foundation Atlanta, then call us today at Atlas Piers!